AC Milan found a late winner to keep up the pace at the Serie A summit after they narrowly managed to break down a resilient Genoa outfit 1-0 at San Siro on Wednesday. Juventus' slender win at Cesena meant the Rossoneri would have to equal their result to ensure their deficit remained at three points, and Massimiliano Allegri's side looked to be on their way towards making it only one win in six league matches, before Kevin Prince-Boateng popped up in the nick of time. Unsurprisingly it was the champions' who took the match to their opponents from the offset, with Zlatan Ibrahimovic again spearheading the Milan attack and being entrusted with the responsibility of leading the line, while Stephan El Shaarawy and Urby Emanuelson tucked in behind. 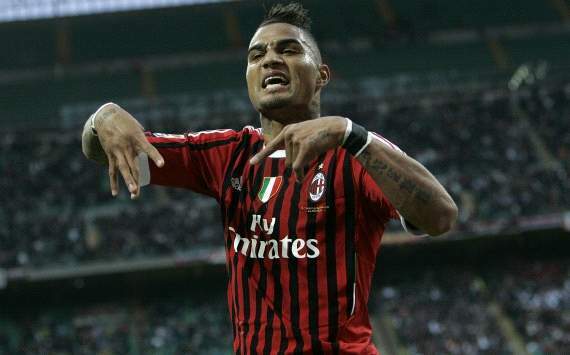 However, the first notable chance of the game fell to Genoa, amid calls of a Milan handball offence. Rodrigo Palacio sent through Juraj Kucka on goal, but the Slovakia midfielder's shot was shut down by Alessandro Nesta with a flailing arm. However, the incident went unpunished. Genoa came to San Siro with a game plan, and much to the delight of new coach Luigi De Canio, his team's compactness and tendency to breakon the counterattack was working. The hosts' spark seemed to fade as the half wore on. And the second half was no different, or so it seemed for most part. Boateng, Ibrahimovic and Nocerino all had snapshots at the Genoa goal, but they all proved futile as the Rossoblu did their utmost to stifle the champions, and the fans understandably became restless. Allegri was in no mood to let the status quo suffice, and he threw on Antonio Cassano and Maxi Lopez to compliment the introduction of Boateng earlier in the match, in a bid to force a hugely-important winning strike. But the Grifoni's fine work in neutralising the Rossoneri took a huge blow with 20 minutes left to play, as Bosko Jankovic foolishly slid into the back of Ignazio Abate on the edge of the box to receive a red card, and it seemed a potential turning point had been realised. From the resulting free kick, Mario Yepes had the goal at his mercy, but a superb instinctive stop from Sebastien Frey meant Genoa would live on for a little longer yet, but they could only take so much of Milan's wave after wave of attacks. The gap remains three points at the summit with only four matchdays left, while Genoa continue to hover dangerously over the relegation places.